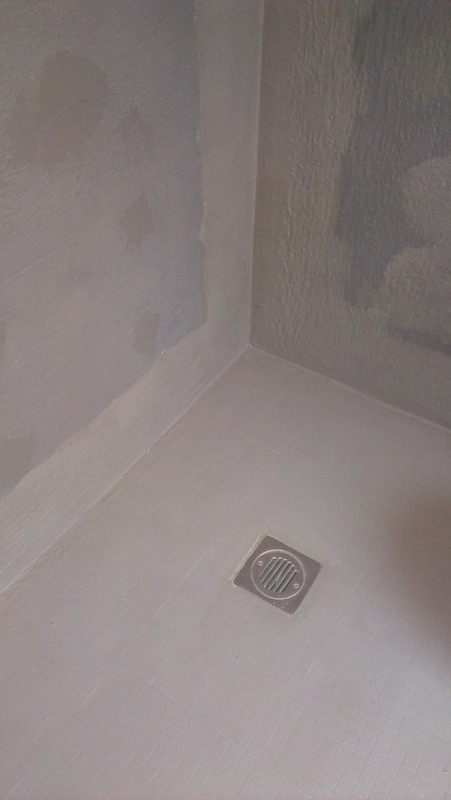 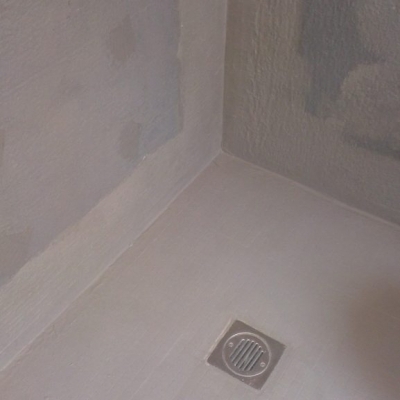 Leaking showers or wet rooms can be annoying, but when the leak is not revealed by stains on ceilings or adjacent walls the damage is hidden, but still continues. 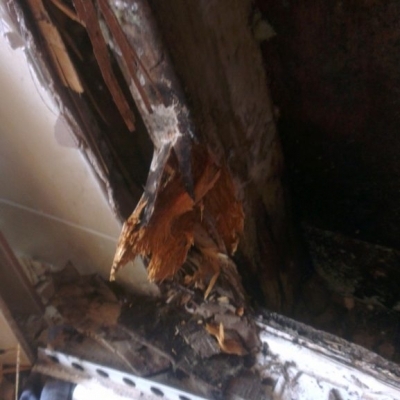 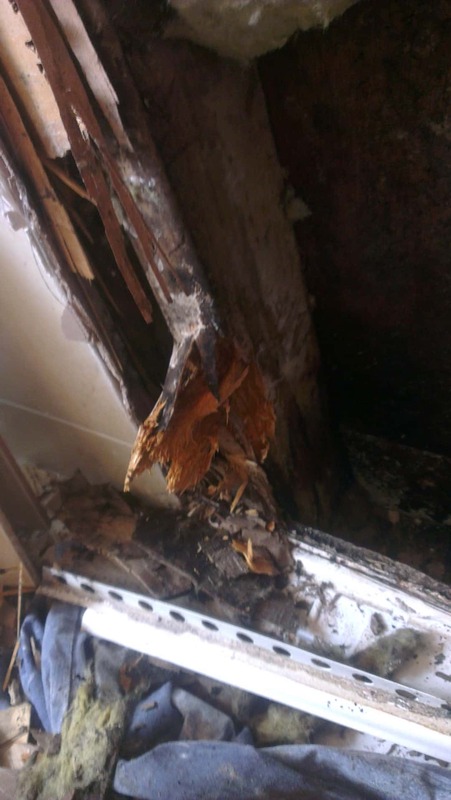 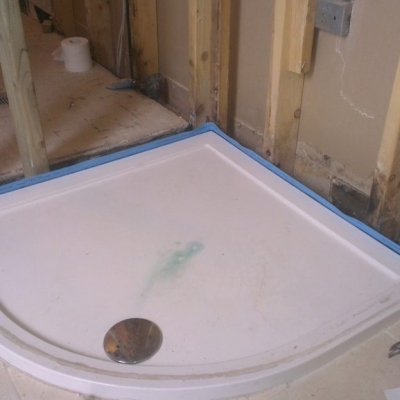 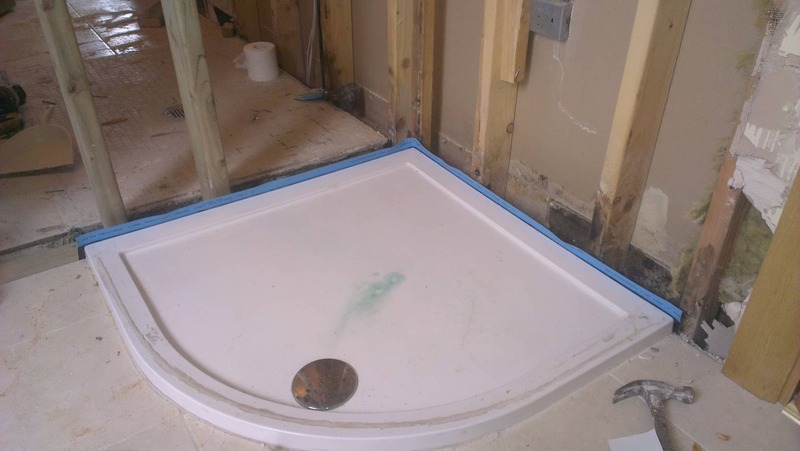 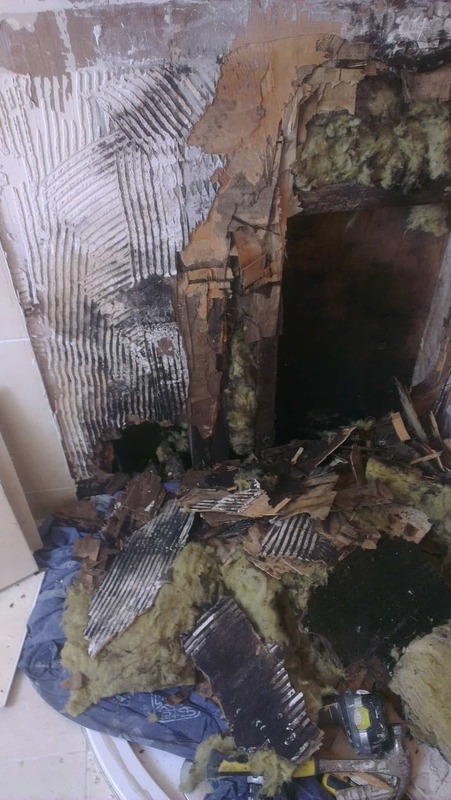 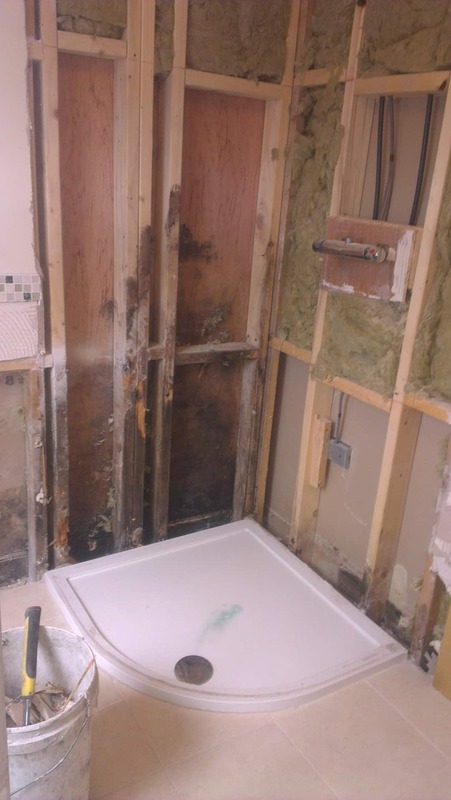 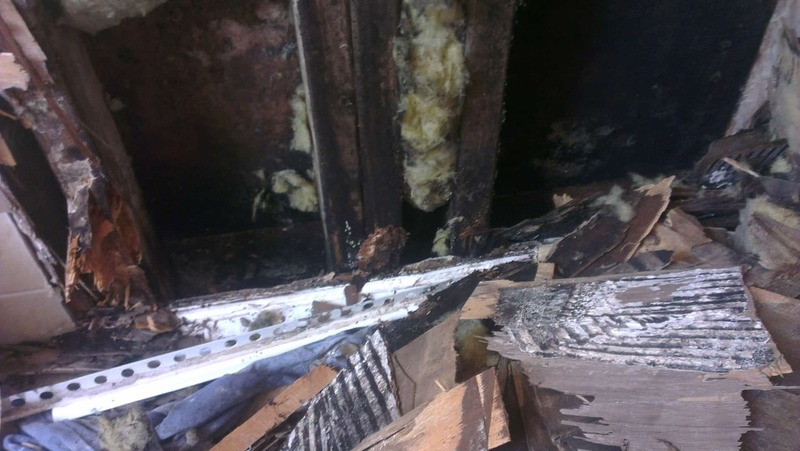 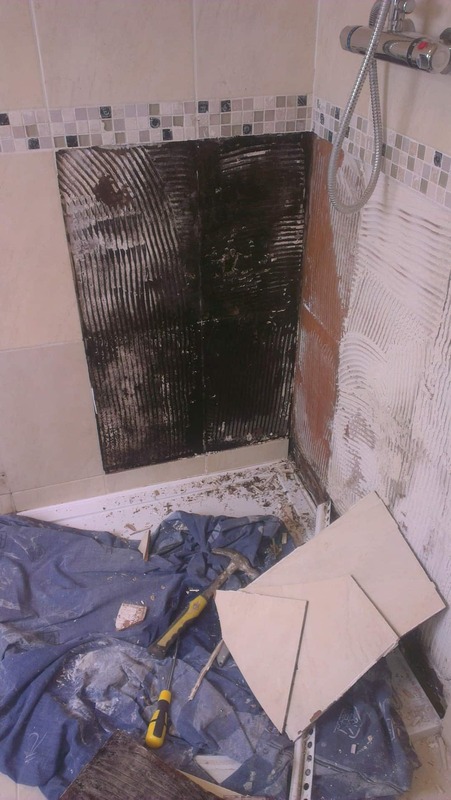 When this happens the damage that has been caused by the leak is first noticed by loose tiles or even tiles that are falling off the wall, and there is no quick fix for this. 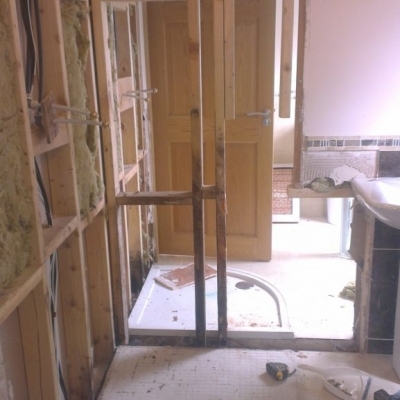 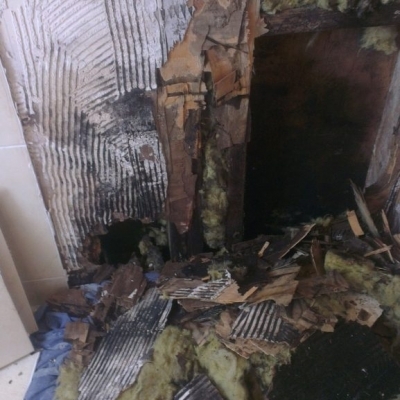 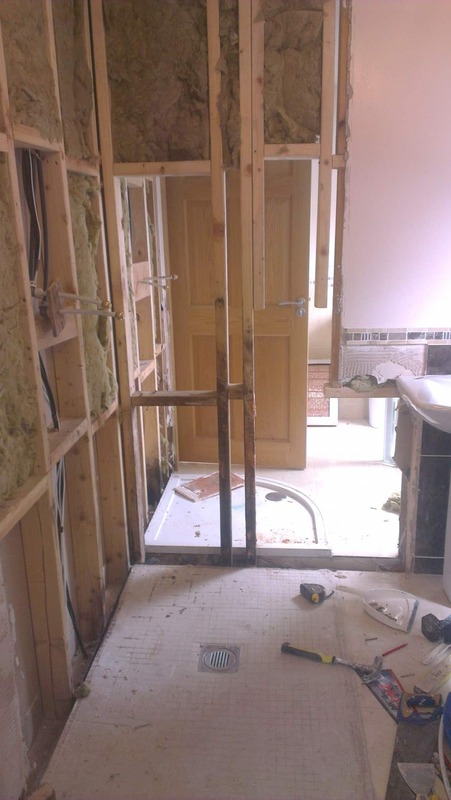 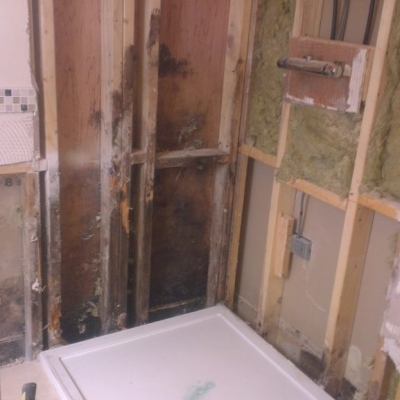 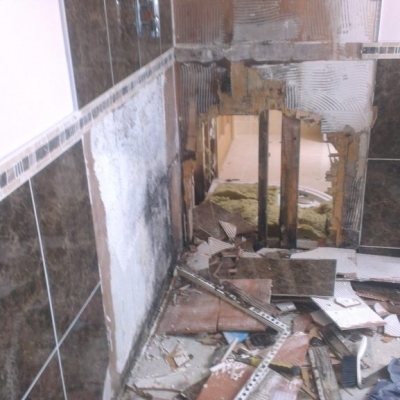 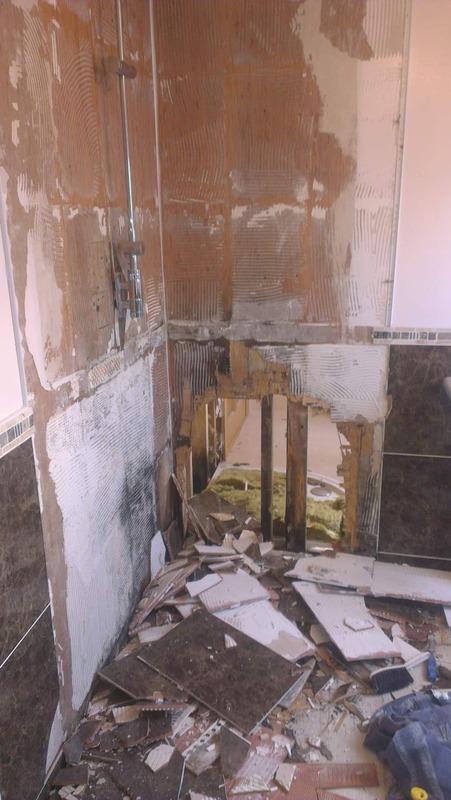 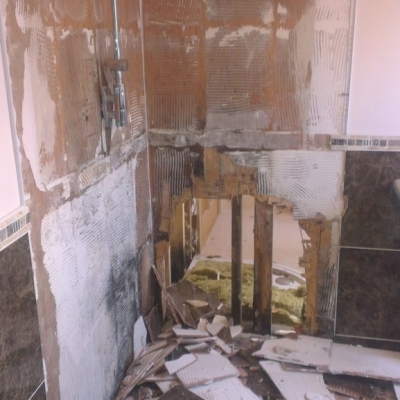 This is what has happended in this house, but the damage was twice as bad because both the shower and wetroom were leaking. 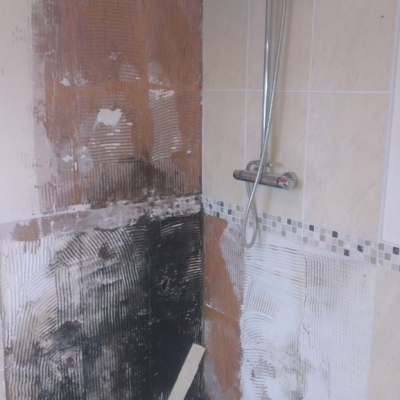 There are a few reasons for this but the main one is because the tiling was done I’m guessing around 5 years ago by the carpenter when the house was being built, not to save money but because the carpenter said he could do tiling. 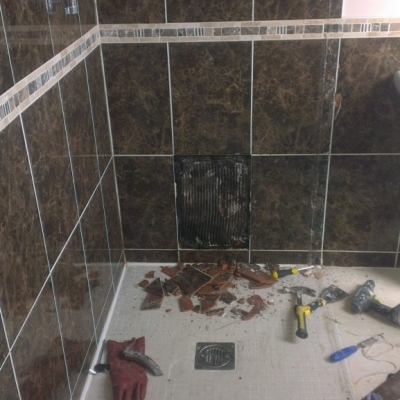 Well he may think he’s a tiler as well as a carpenter but the pictures below might suggest this is not the case. 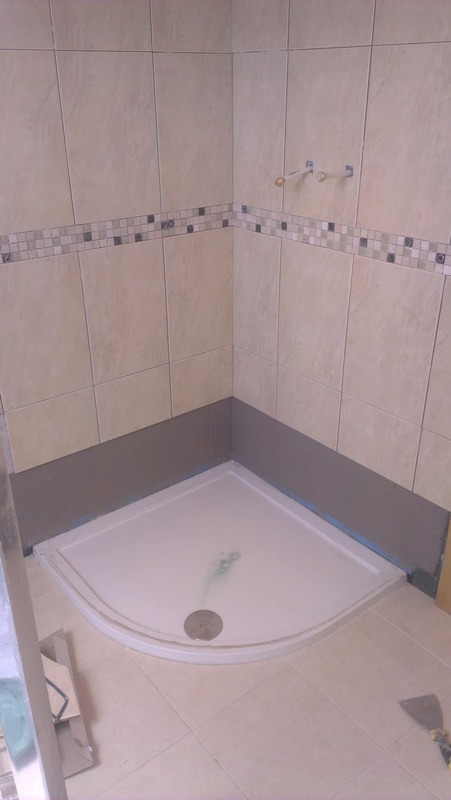 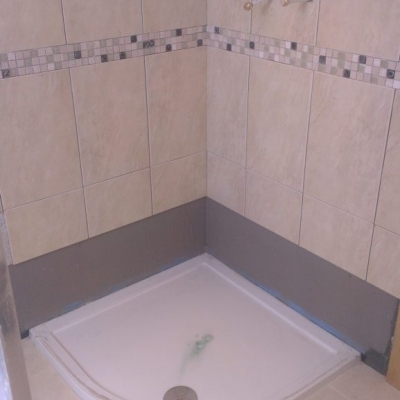 The actual tiling mistakes are a few, I wont get too involved in each one but firstly the wrong adhesive was used, category B was used instead of category A which is waterproof. 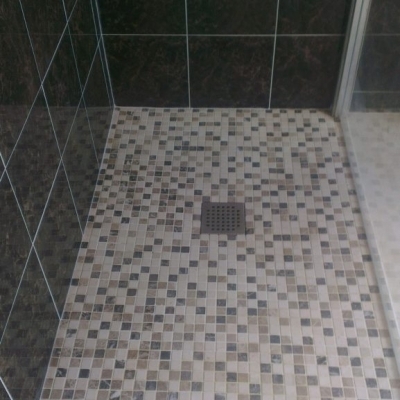 The timber used to tile to was 12mm thick instead of 18mm which is the minimum that can be used to tile too. 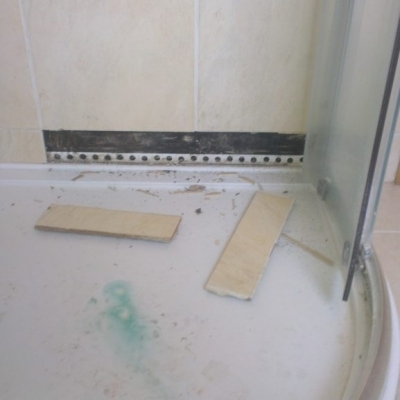 The timber was incorrectly fitted: not enough screws were used and it didn’t even reach the shower tray, so I’ve no idea how he thought it would be watertight. 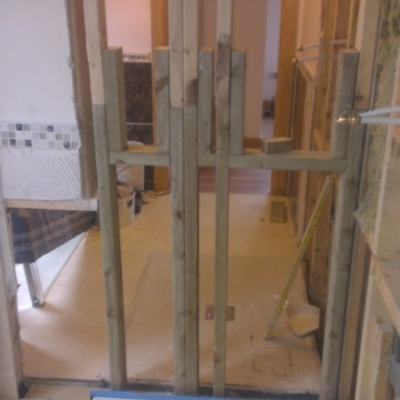 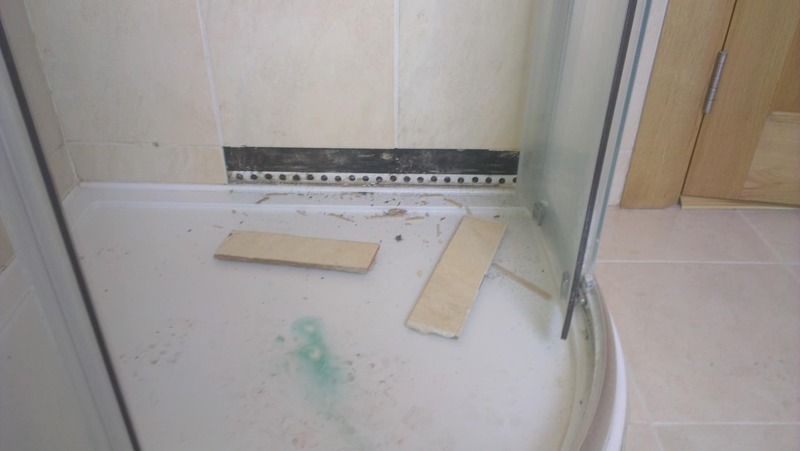 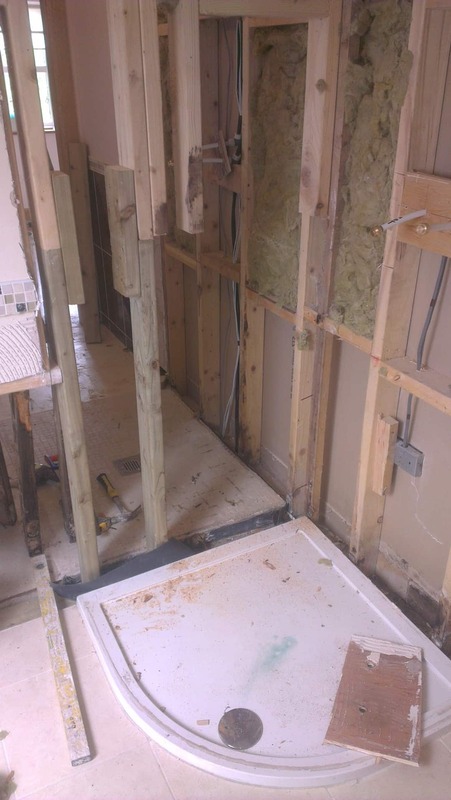 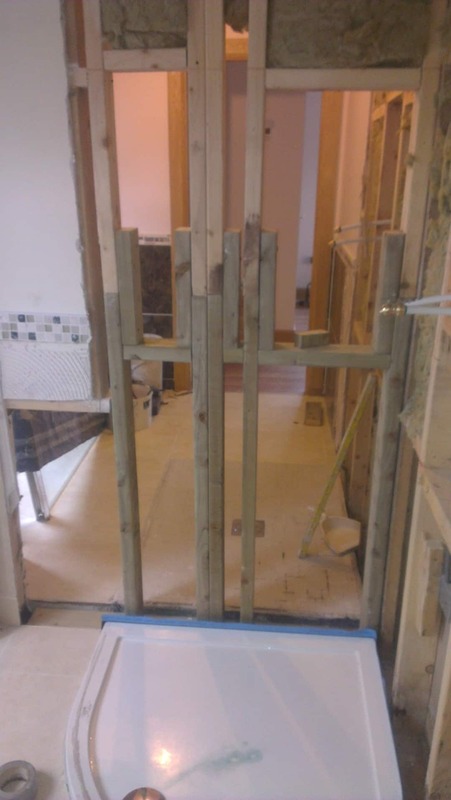 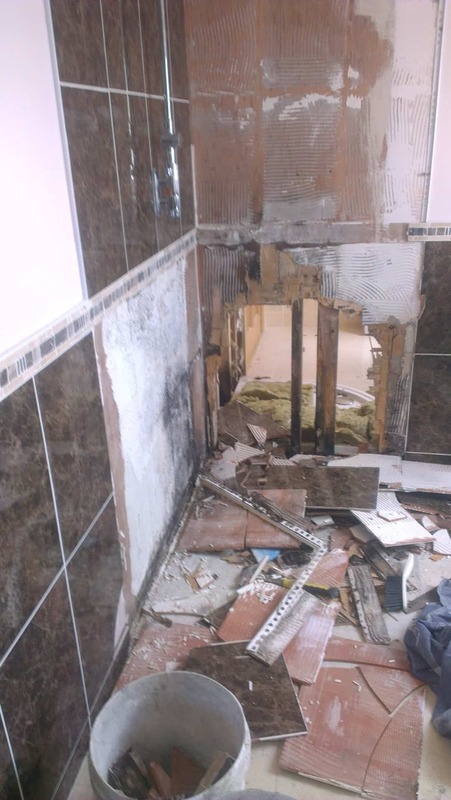 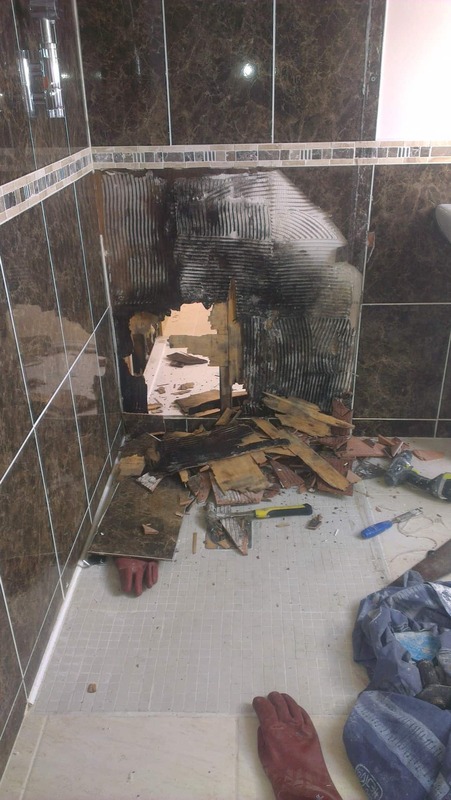 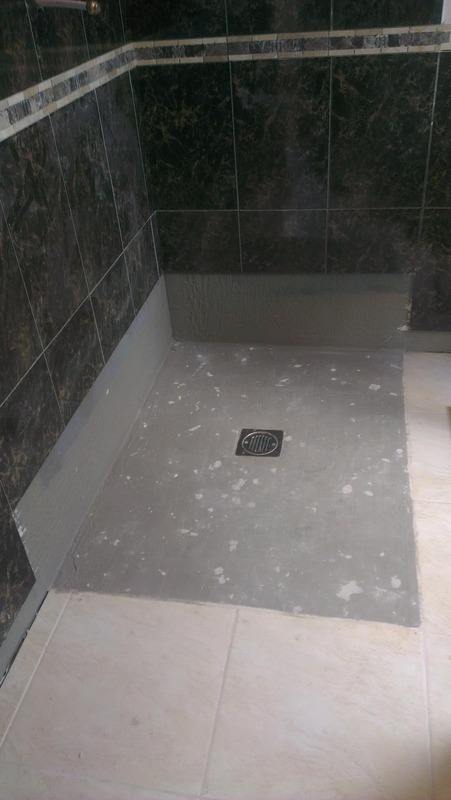 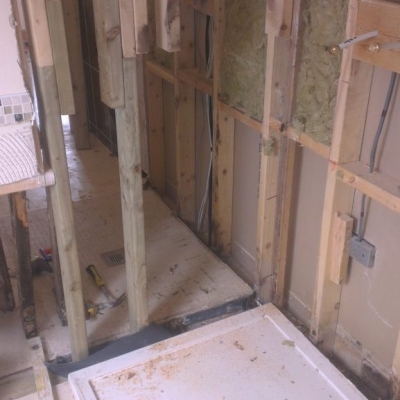 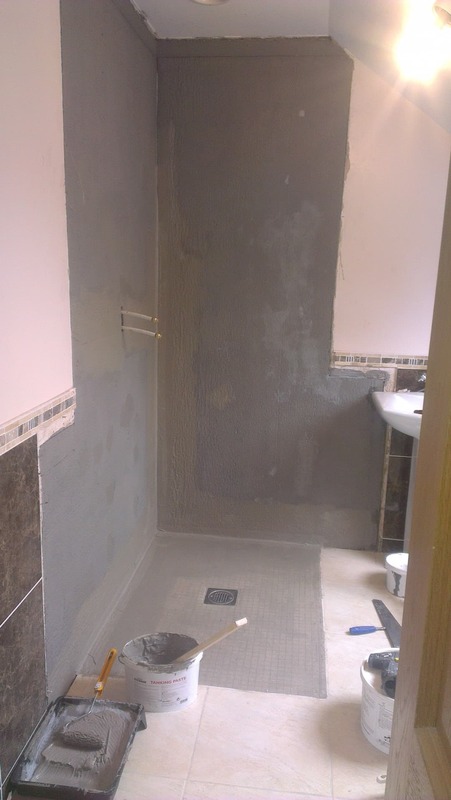 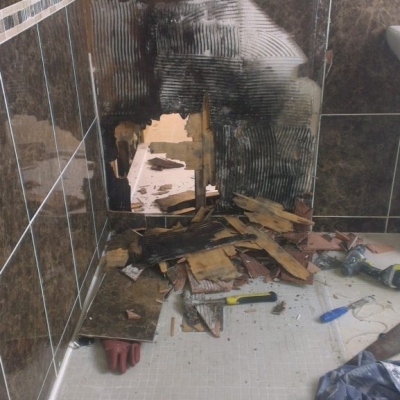 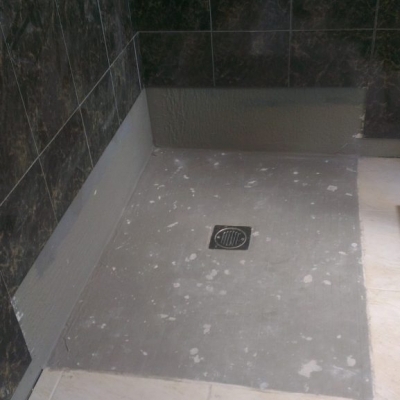 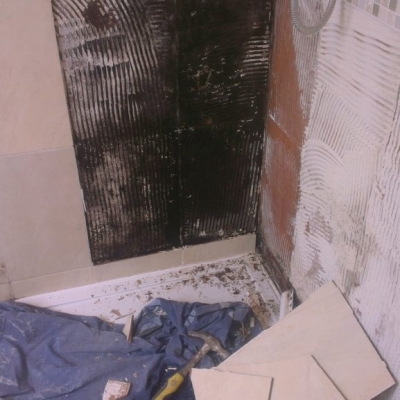 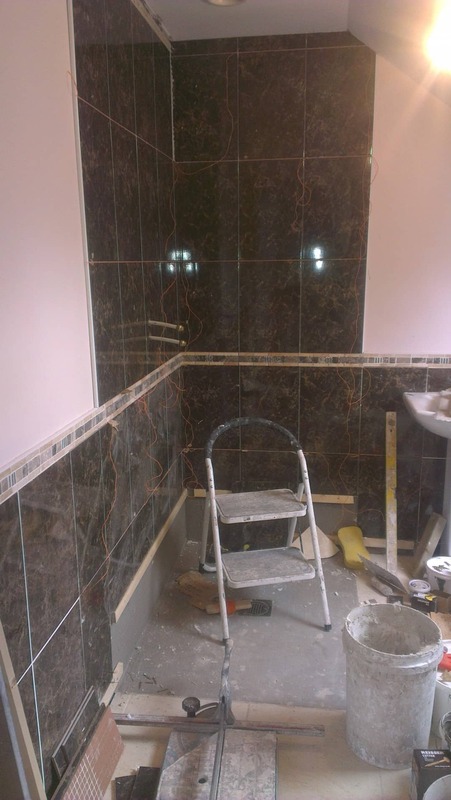 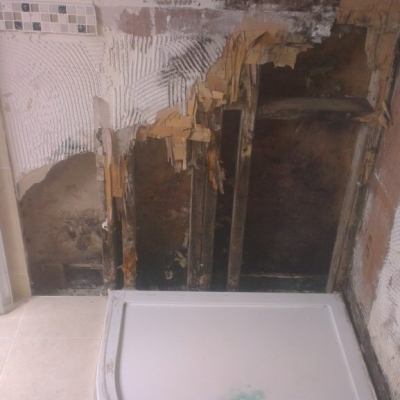 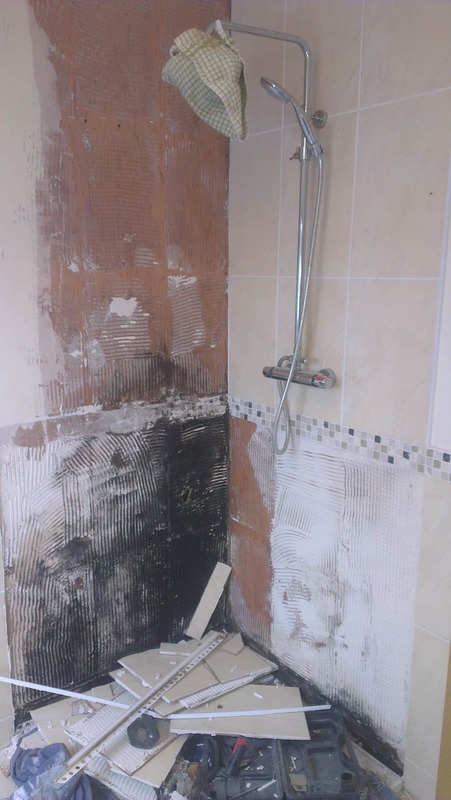 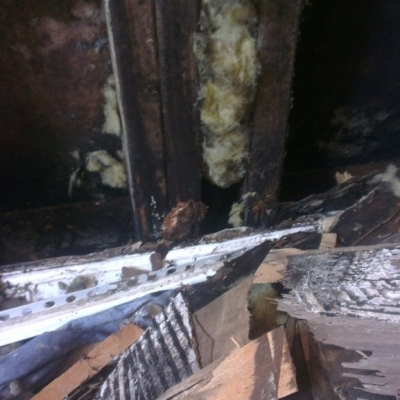 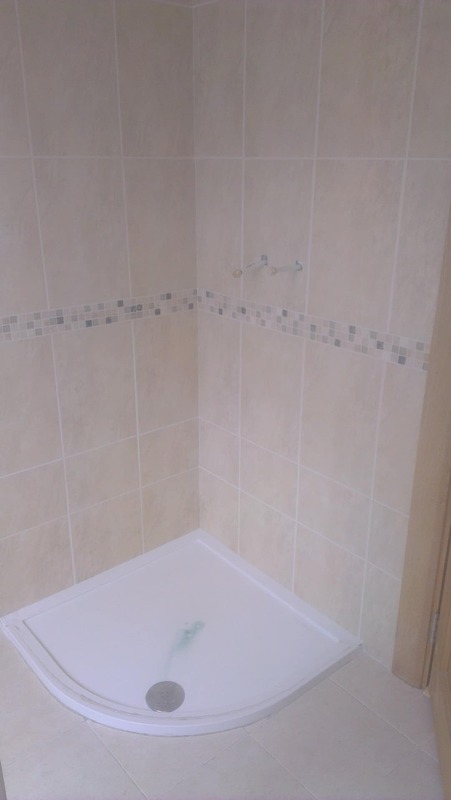 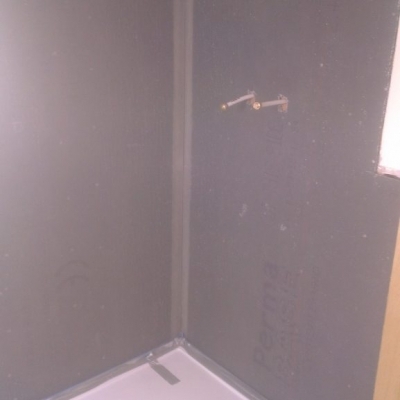 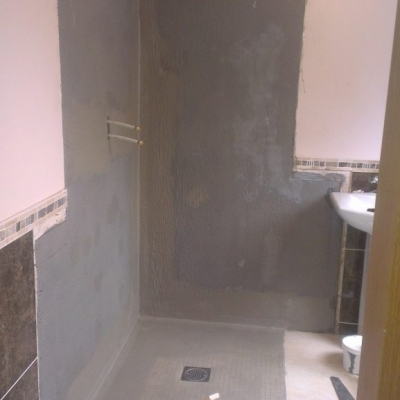 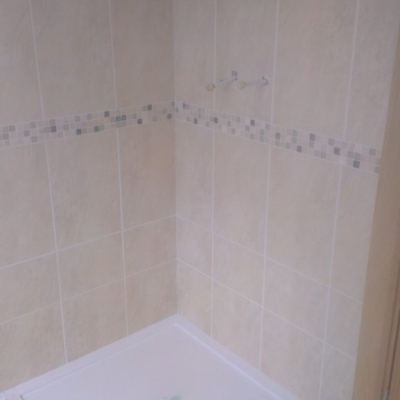 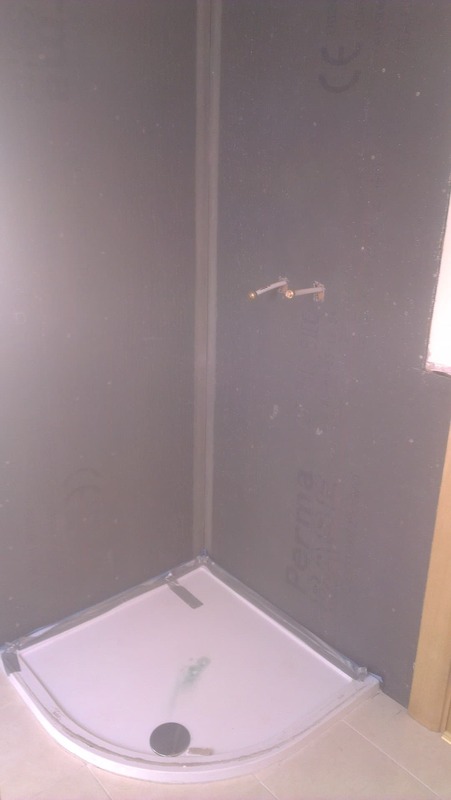 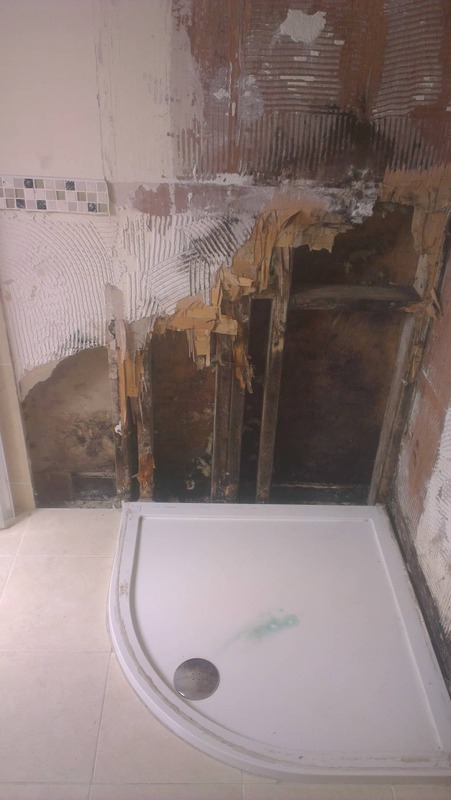 The timber sheeting was not sealed or primed, this was compounded by an incorrect tiling style, he put the adhesive to the tile and pressed the tile onto the wall, all this did was to stick the tile to the dust on the timber, what he should have done was spread the adhesive on the wall and stuck the tile to it, this is why you can see the timber sheeting so clearly in the pictures when the tiled popped off, the tile didn’t actually bond to the timber. 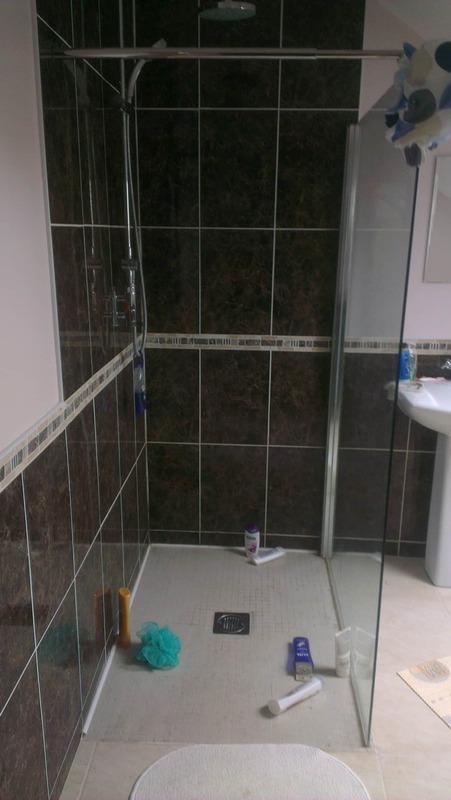 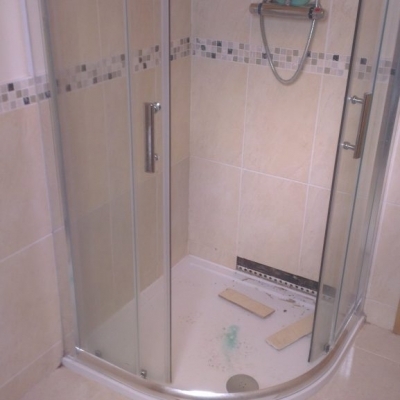 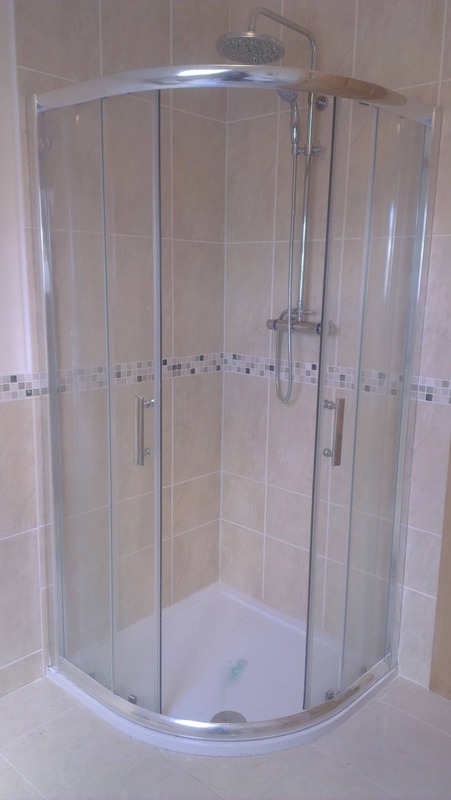 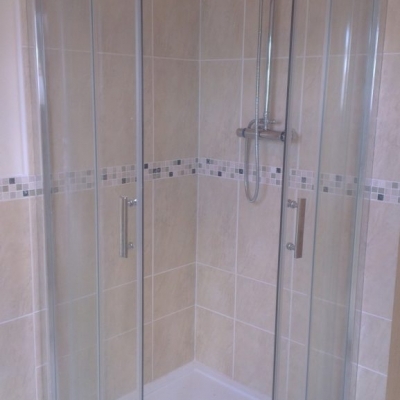 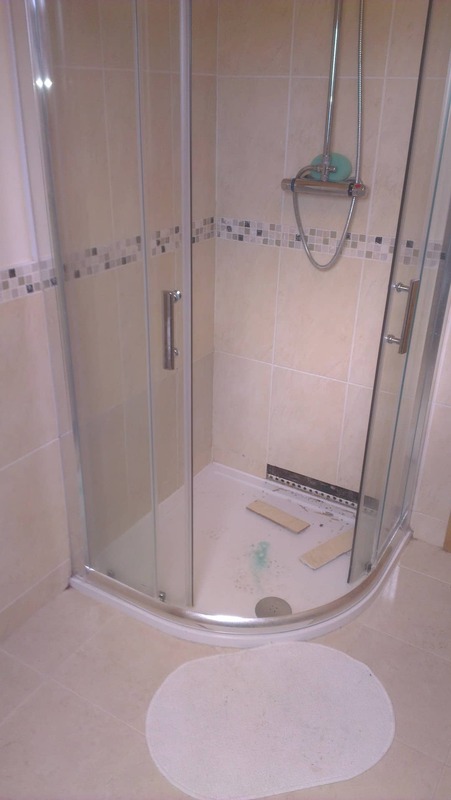 There was no tanking fitted to either the shower or the wetroom, and as this house has a pressurised water system with rain showers fitted in both rooms I think that was definitely an error of judgement. 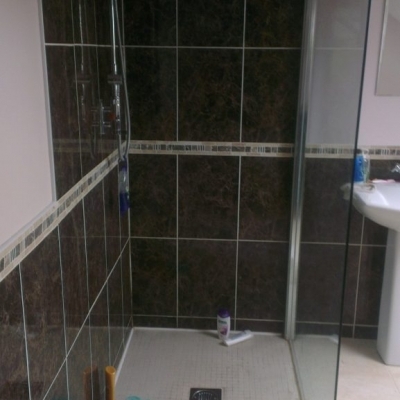 The actual job was fairly involved to do and extremely messy and took around a week to complete using various skills that tilers don’t often get involved in, and yes I did employ a plumber to remove and replace the shower fittings as I’m not a plumber 🙂 but it was satisfying to complete and now their bathrooms are as perfect as the rest of their home. 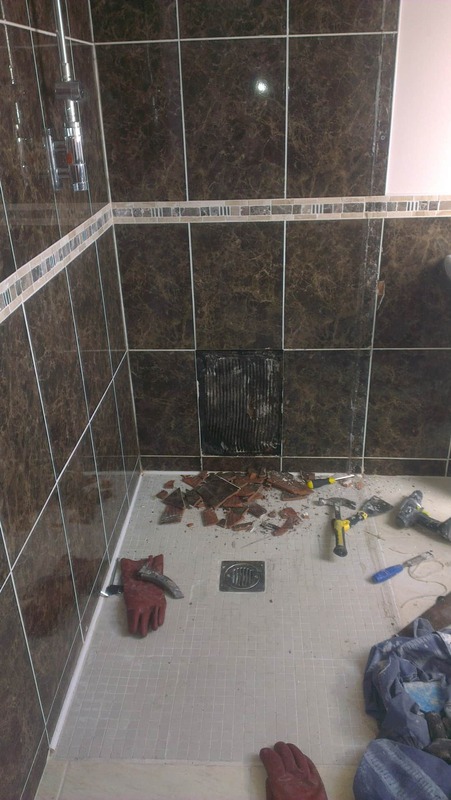 I think the morale of the story is that everyone has their own knowledge skills and experience, so if you want tiling done employ a tiler and if you want carpentry done then employ a carpenter etc, and also if possible see pictures of recent previous work that they have completed to confirm that they can actually do what they say they can do. 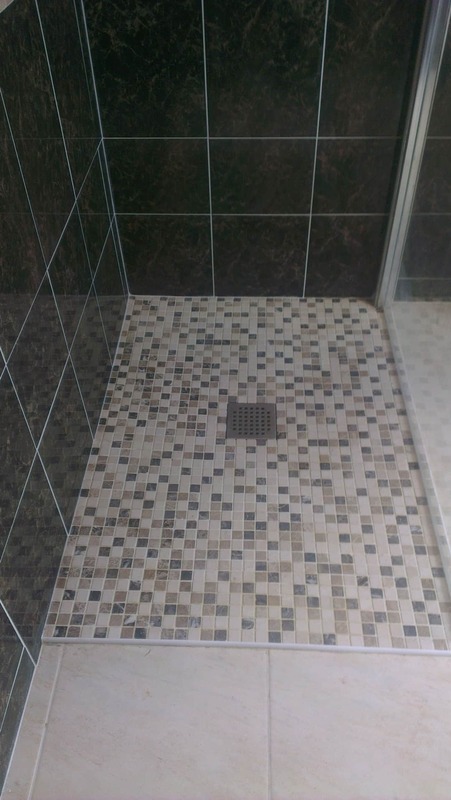 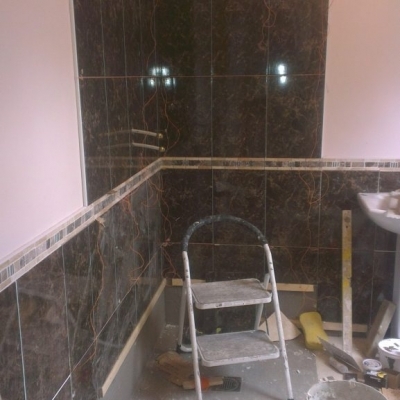 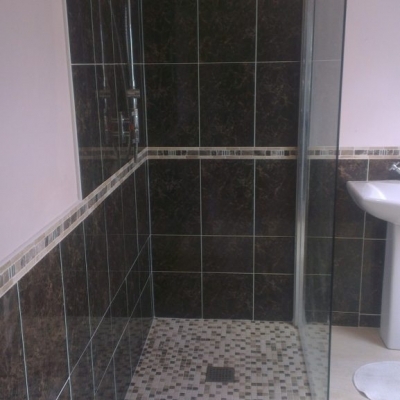 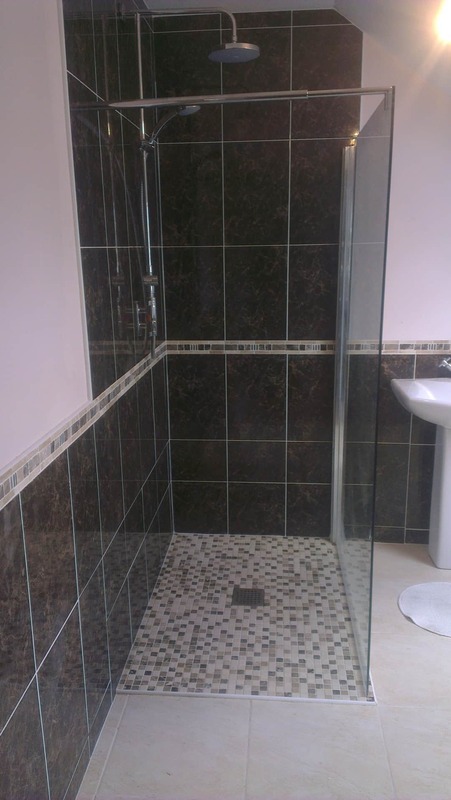 I often see adverts for bathroom renovation companies saying that they can do everything, electrics plumbing carpentry and tiling, well possibly they can but before you give them a job just make sure that the person who does the tiling is actually a tiler and not the carpenter who can do a bit of tiling, because if you don’t you could end up with your home looking like these pictures in a few years time, and trust me you wouldn’t like that.